Torrential rain in isolated areas of the Lower Hunter resulted in flash flooding yesterday. 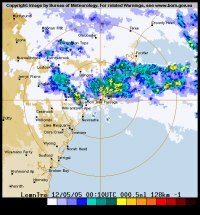 The heaviest falls were recorded in Raymond Terrace with 134mm recorded in just 5 hours from 7am to midday. The total rainfall for the 48 hours ending 9am today was 150.2mm. Williamtown, Medowie, Tomago and Lemon Tree Passage also got hit by the heavy rain. Williamtown recorded approximately 80mm of rain in the 24 hour period ending 3pm yesterday. Majority of this rain fell between 7am and midday also. Flashing flooding occurred in Raymond Terrace and the nearby farmlands. The flooding resulted in road closures. Other areas in the Lower Hunter received some moderate falls, but were not substantial as observed over the Raymond Terrace area. Newcastle University recorded less then 50mm in the 48 hours till 9am today. Morpeth (Berry Park), which is less then 10km from Raymond Terrace, recorded 90mm less then Raymond Terrace (60mm in total) in the 48 hour time period ending 9am today. This shows how localised the rainfall patterns were yesterday. It is most likely that the downpour recorded yesterday in Raymond Terrace was the heaviest in more then 25 years.